Though thankful to be writing in the wake of an Obama victory, I’m going to take as a departure point for my reflections on the practice of nation-branding Jeremy Mende’s imagined outcome of a Republican triumph. 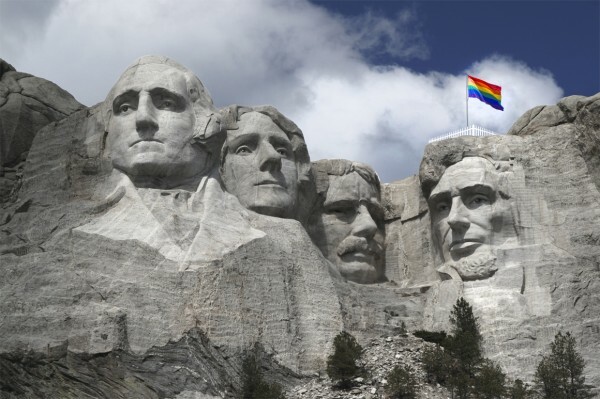 Envisioning the need for a “sweeping public relations campaign” in 2014 after an ensuing foreign policy quagmire, Mende’s project depicts the official installation of a rainbow flag on Abraham Lincoln’s Rushmore head, among other rebranding initiatives. The satire works, of course, because the modification of the timeless monument seems ludicrous in light of the discriminatory biases of Republican Realpolitik. Yet I would argue that the increasingly widespread influence of nation-branding consultancies often results in just these sorts of Orwellian makeovers. Despite claims by branding experts that their campaigns are “authentic” because their research methods capture the “distilled essence” of a country’s location, culture, and character, the prevalent tendency toward spin is what Garry Trudeau derides in his series of cartoons Tee Time in Bezerkistan. In the series a despotic Ruritania hires Washington-based consultants to create a nation-branding campaign to remake its image after engaging in ethnic cleansing against its people. Their solution, among others? A celebrity golf tournament. Today there are numerous authoritarian or quasi-authoritarian states employing the services of nation-brand consultants to remake their international reputations. Three years ago Nigeria launched its campaign, “Good People, Great Nation,” which the Ministry of Information announced to much fanfare as “a march toward national re-birth.” Qatar’s campaign, “As Independent as You Are,” is credited for having secured it the 2022 FIFA World Cup. In a world where virtual communities are continuously forming and reshaping themselves, branding experts are advising national leaders that they need highly controlled identities in order to compete for their share in today’s experience economy. With the spatial and temporal disorientation that comes with globalization and an increasingly mobile population, the seemingly intractable need for community belonging is not disappearing but becoming extenuated. Nations are competing to meet those affective needs alongside corporate-defined communities of brand loyalty and lifestyle, and the largely self-defined hive communities forming online. What is unnerving is that the specter of conservative nationalist messaging is alive and well in these government efforts, despite lively academic discussions of postnational and emancipatory forms of identity production. 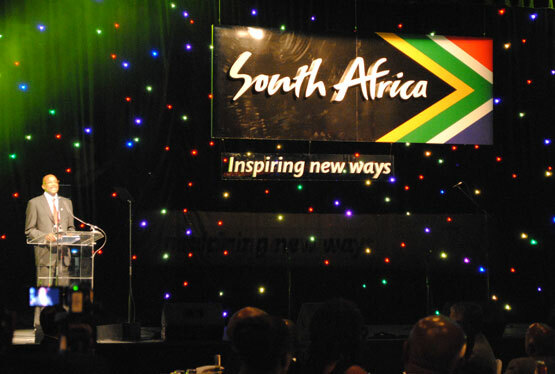 What I am troubled by, and have been researching for my own scholarship, is how nation-branding campaigns influence citizenship, belonging, and memory work undertaken in young nations attempting to establish representational systems of governance — particularly those that are emerging from a period of political turmoil, such as South Africa. The corporate gurus who have pushed the field of nation-branding to the foreground of public diplomacy sell their services to postcolonial countries that often do not have the traditional nation-building constellation of ethnicity and language. Branding, then, becomes a matter of fabricating a shared heritage, though of a different kind, and a form of social engineering. (Above) The Propeller Group, headquartered in Ho Chi Minh and L.A., imagines how “capitalism’s most flamboyant progeny, the advertising machine,” would represent Communism in a post–Cold War context collaboration with TBWA/Vietnam, 2011. More details here. What does it mean to push one-dimensional, essentialized identities at a moment of ever-increasing immigration and diaspora? What does it mean to create a branch of government to ensure that all brand messaging originating from the public and private spheres adheres to one unified platform that, in all likelihood, has been created by a British or U.S. consultant? My questions have to do with how such aggressive branding strategies condition understandings of the public sphere — who belongs and who doesn’t — in countries whose diverse populations are often already tenuously held together. Nation-branding practices demonstrate that collective identity and memory, when driven by political and economic exigencies, can shore up antiquated national mythologies. This neoliberal logic has little use for its Other: the subversions that flourish in the informal, marginal, and underdeveloped zones of the social sphere, and in the messy but critical long-term work of piecing together complex and competing historical narratives. Brands may tell stories, but they usually tell simple stories. One might ask why nation-branding as an industry has taken off in the last 15 years, just as networked societies and the pace of globalization hit their stride. Nation-branding clearly stands in direct opposition to discourses calling for postnational forms of identification: utopian aspirations perhaps for nonterritorial, complex, and diverse forms of belonging. Wikileaks and the Arab revolts are just two cases that suggest the power of the Internet leaves few places, if any, where public opinion can be controlled through traditional mass media channels. The explosion of nation-branding campaigns and the number of young countries lining up for services could be read, I suppose, as a reaction formation, the last gasps of nationalism and imperialism, with the parade of consultants colonizing air space. Is the fluidity between hard and virtual contact, between Twitter and the street protest, a sign that the hive is reassembling itself outside the brandscape? Or is it the nature of power and collective affect to fall back on the same traditional patterns of imagining communities? Only time will tell if these forces will find a balance between consensus, stability, and entropy. Karen Fiss is associate professor of visual studies at the California College of the Arts. This fall she curated the film exhibition Blue Flowers in a Catastrophic Landscape at the Museo Nacional Centro de Arte Reina Sofía in Madrid. Her current research examines the history of “nation-branding” in the production of visual culture, from the rise of the nation-state to its contemporary role in shaping the social, artistic, and built environment of postcolonial emerging economies. Fiss is at work on two book manuscripts: From Nation Building to Nation Branding and Modernity on Display. Previous publications include Grand Illusion: The Third Reich, the Paris Exposition, and the Cultural Seduction of France (University of Chicago Press, 2010) and Discourses: Conversations in Postmodern Art and Culture (MIT Press, 1990).